One of the wonderful aspects of our global sailing tour is the ability to visit remarkable cultural and historical parts of the world. Sometimes they are land-locked and we have to take an excursion farther from Golden Glow. Last weekend we took the high speed train to Florence, yet another pearl on the necklace of culture with its great art, food, historical personalities and architecture. 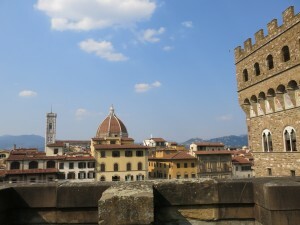 Florence is heralded as the birthplace of the Renaissance. The city is home to first dome built after the fall of the Roman Empire: the Florence Cathedral Santa Maria del Fiore, also known as the “Duomo” or Brunelleschi’s dome. We arrived in Florence near midnight. After dropping our bags at our hotel, we went back out for a midnight stroll in the city. 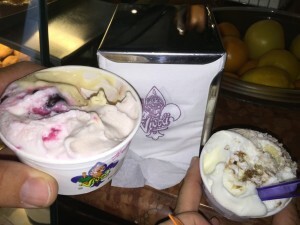 Ellen wanted to stop at her favorite Florence gellateria, Vivoli’s, which she’s been going to since she was 17. It wasn’t far from our hotel or the main square, Piazza della Signoria. 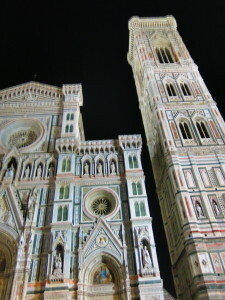 The buildings of Florence are art themselves, and often they were designed by the leading artists of the Renaissance including Giotto (the “father” of the Renaissance), Michelangelo, Brunelleschi and others. What is amazing to me is that Leonardo Da Vinci and Michelangelo were hanging out at the same time in Florence. What it would be like to be having dinner with them? I wonder if there was any artist ego in the 1500’s. 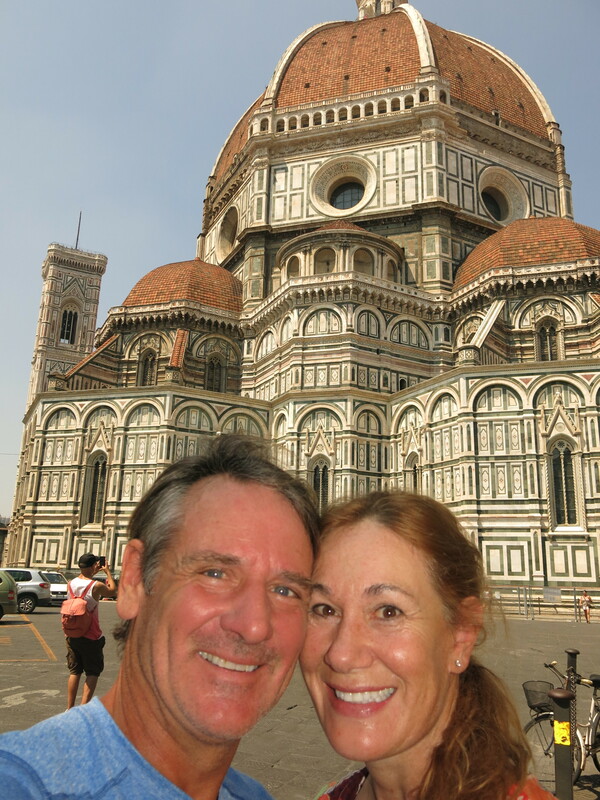 We went to two famous art museums, the Uffizi and the Accademia. The Accademia is best known as the home of the original Michelangelo’s David: the amazing sculpture of the adolescent boy with slingshot draped over his back in preparation for battle with Goliath. Now that must have taken some courage.It is worth going to the Accademia to see the original David in marble rather than just seeing the concrete copy in Piazza del Signore. The artistry, detail and luminous beauty of the original in marble has to be seen to be believed. Michelangelo was 26 when he started working on the David statue in late 1501 and it took him two years to complete it. Work was begun on the marble block in 1464 and three different sculptors set their hands to the stone in the 37 years before Michelangelo took over. The statue was originally commissioned to be placed high up on the ridgeline of the Cathedral. 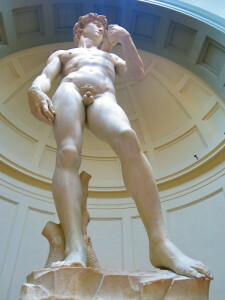 Our docent at the Uffizi said that is why Michelangelo made the head so large – to be seen properly from so far below. After the statue was complete, its weight was so great that it couldn’t be hoisted to the top of any building, so a place was made for it at ground level. In 1504 the David was finally unveiled and within a year the sculpture had a leaf treatment added to cover David’s privates. Now, many centuries later, men can now see exactly how big they need to be to take on a giant. And those feet? Can you say frodo? But seriously, the detail and accuracy of the human body in sculpture is remarkable down to the veins in David’s hands and rippling muscules. Because Michelangelo was already famous when he worked on it, he was allowed to study cadavers to learn the human body (something not normally allowed other artists). We also went to the Uffizi, home of some of the best Renaissance art in the world. 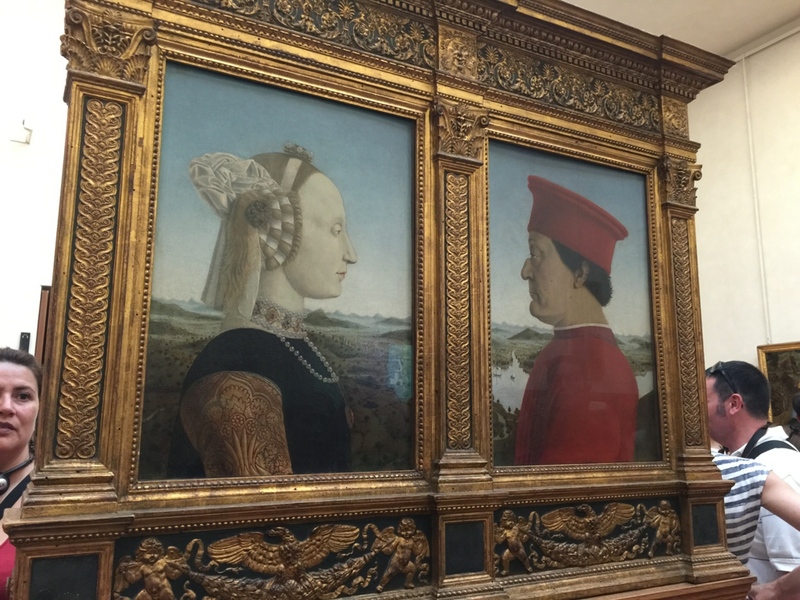 Two of our favorite works by Botticelli, the Birth of Venus and La Primavera (Springtime) hang in the Ufizzi Museum. Going through the museum with a guide allowed us to skip the long admission line, but also enhanced our appreciation of the works of art. 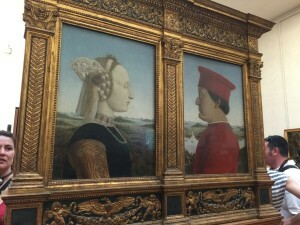 For instance, we might have walked past the portrait of the Duke and Duchess of Urbino by Piero della Francesca had we not known that her pallor was because she had died in childbirth before her husband commissioned this portrait. He had a mask made of her face after she died, and this was all the artist had to work from. Also, her husband’s unusual profile wasn’t something he was born with. 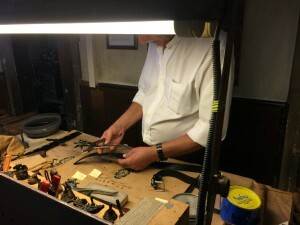 He lost his right eye jousting and had his doctor break the bridge of his nose with a hammer so he could see better to the right with his left eye. Ouch! 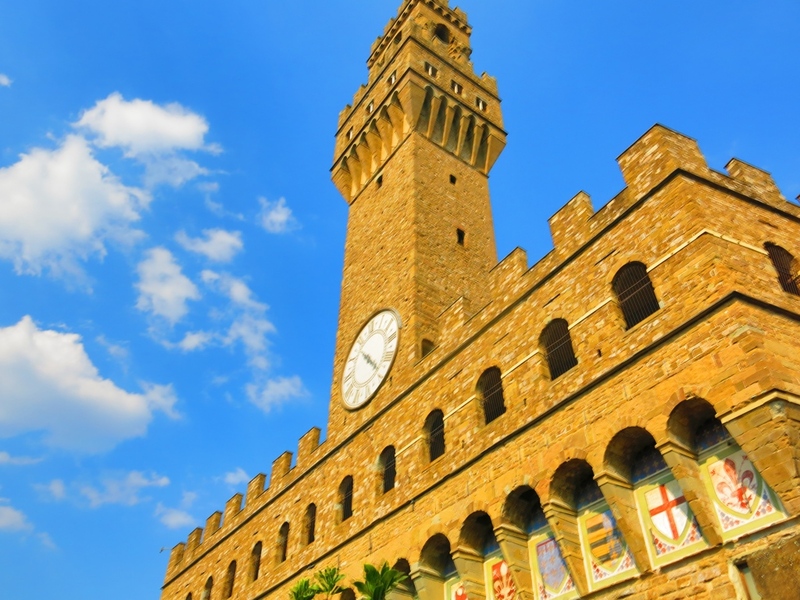 The Uffizi means “the offices” because back in 1560, Duke Cosimo I de’ Medici built them as offices for the magistrates of Florence. To get to his offices from his residence at the Pitti Palace across the Arno river, he had to cross the Ponte Vecchio bridge which at the time was dirty and smelly with horses, fish markets and common-folk. 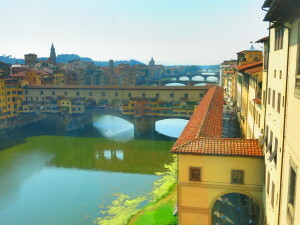 So Piero had a private enclosed walkwalk built from the Uffizi all the way to the Pitti Palace. He also declared that only gold and silver could be sold on the bridge (because they don’t smell) and to this day, that’s all the shops sell on the Ponte Vecchio. 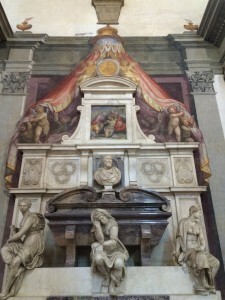 “Michaeli Angelo Bonarotio” is buried here. In the same room as Galileo and Dante. Star studded urns to be sure. 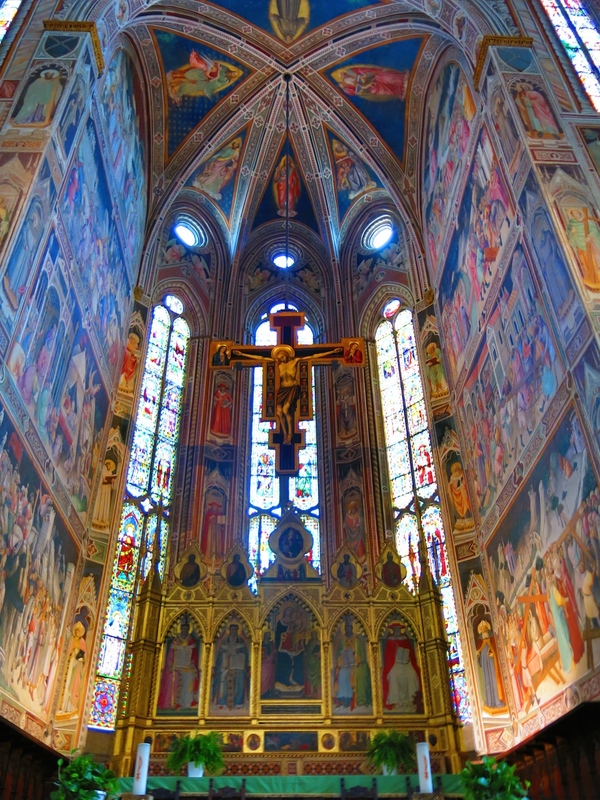 Before leaving Florence, we also made a pilgrimage to the church of Santa Croce. 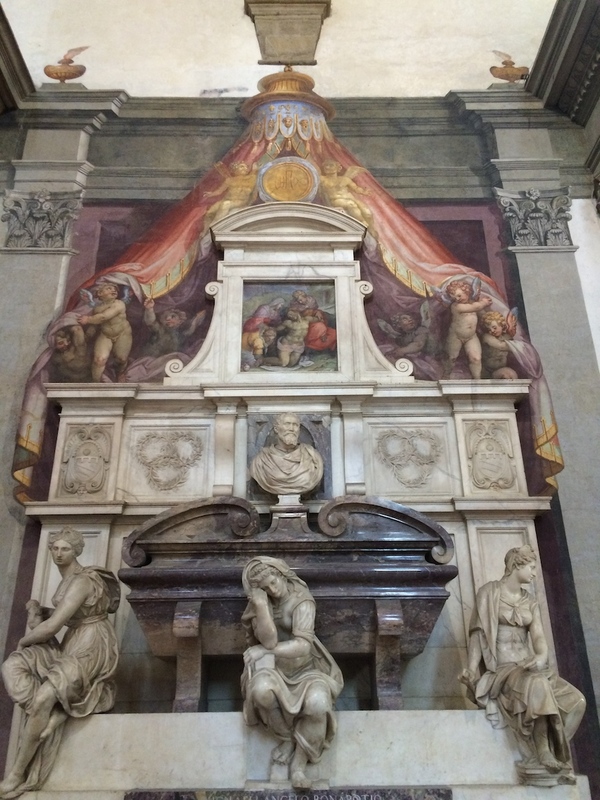 In addition to being one of the most beautiful churches inside, Michelangelo, Dante and Galileo are all buried here. 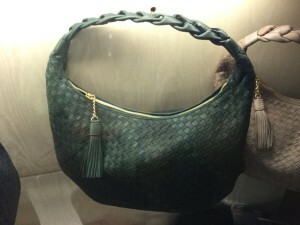 Santa Croce also has a leather school and shop where goods are made by some of the finest leather craftsmen in Tuscany. Tucsany is also home to some of the best wine in the world, especially the Super Tuscans and Chianti Classico Riservas, all of which are better priced in Florence than you will find anywhere else. 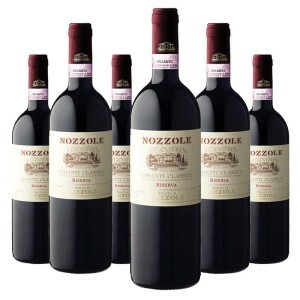 To Vino! After our weekend in Florence, standing on the Ponte Vecchio, we were treated to a great sunset over the Arno after viewing some of the finest Renaissance art in the world. 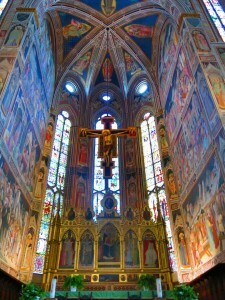 A Florentice Golden Glow. 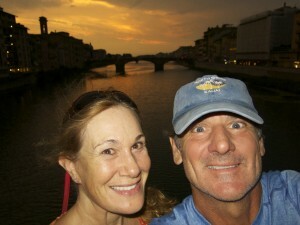 Goodnight Florence.